Sailing from Nettuno or other ports south of Rome, offers access to almost all the islands of the Tyrrenian Sea: to the Argentario in Tuscany, Ischia and Capri off the the Amalfi Coast, Sardinia and Corsica and to the Pontine Islands! The Pontine Islands are a small archipelago between Rome and Naples rich of history and archelogical sites to visit, especially from the Roman times. It is formed by 6 islands of volcanic origins: Ponza, Palmarola, Gavi, Zannone, Ventotene and Santo Stefano. Palmarola, Gavi, Zannone and Santo Stefano can be visited only in boat trip, while Ponza and Ventotene offer a various restaurants, shops and hotels. Ventotene and Ponza have several archaeological sites; the Emperor Augustus exiled his embarassing daughter Julia to Ventotene and Nero later did the same with his wife Octavia. The remains of the Roman Villa Giulia can be seen on the tip of the Eolo headland by the port. Over the centuries many other notable exiles arrived on the Pontine islands, including the early saint Flavia Domitilla, Sandro Pertini (a prisoner of the Fascists and later President of Italy) and Mussolini (confined here for a few days in 1943). Ponza, unlike most resort islands in Italy, it is fairly accessible. As you make your way down the streets, the island’s surprisingly low-key and laid-back vibe is immediately evident. The streets are unmanicured, the flora and fauna wild and untrimmed. The island’s charm lies in its timelessness and simplicity, attracting celebrities such as Rihanna, Bruce Springsteen, Mariah Carey, Beyoncé and Jay Z. You can enjoy shopping and hear languages other than just Italian. During the day people could stay on board and off the coast, dropping their anchors in one of the windless alcoves that surround the island. You can spend the day diving off the boat, enjoying fresh mozzarella, tomatoes and focaccia. Night life is equally simple; a sunset aperitif followed by a dinner that goes until the last man standing. 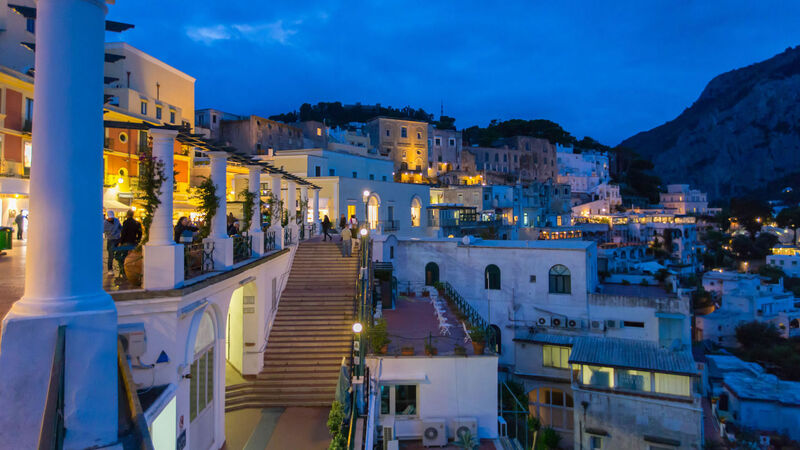 Ventotene, referred to by Homer as Isle of the Sirens, is one of Italy’s best kept secrets. 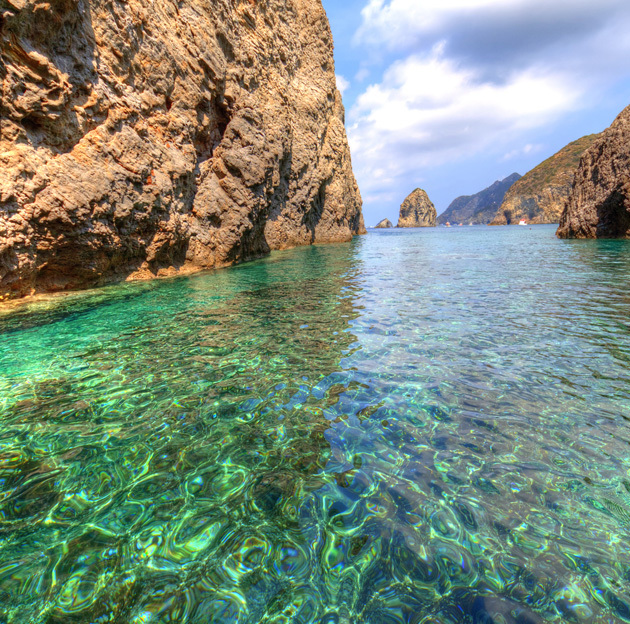 It is officially part of the Ponza archipelago off the coast of southern Lazio, but in reality it is very much apart. Breathing in the heady and drawn by the pull of the clear blue water, you can make your way to Porto Romano: the port was carved out of the porous tufa stone over 2,000 years ago, in 29BC. The picturesque port-side is bustling with fishing boats, dive centers, boat hires and bars, making good use of the ancient warehouses carved into the rock face. Strolling by the outer harbor wall to see the pock-marked rocks (saline) – shallow bowls created by the Romans for collecting sea salt – you get a fantastic view of the pastel-colored backdrop. DAY 1: Check-in at Marina di Nettuno. 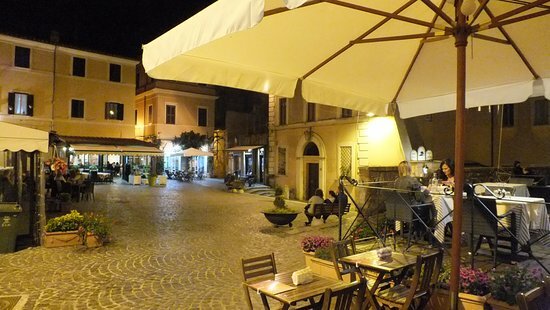 As a popular tourist destination, Nettuno sights include a well preserved old Borgo Medievale, with real medieval streets, and the Forte Sangallo, a castle built in 1503 during the Renaissance. Very close to Nettuno - 10 km - you can visit the peninsula of Torre Astura, the ruins of the old Cicerone's villa and further, the Mount Circeo, a natural reserve connected with the Legend of Circe (https://en.wikipedia.org/wiki/Circe), the fascinating goddess in the Homer's Odyssey. DAY 2: PALMAROLA is the most western island of the archipelago; many dangerous points surround its coasts but you'll be able to find great places to anchor. We suggest you visit Punta Tramontana, from where you can admire a beautiful bay called "The Cathedral" because of its cliff falling vertically to the sea and the big bays which remind us of that image. During the summer, you'll find Cala del Porto, a small restaurant on the shore. DAY 3: The port of PONZA can harbour up to 200 boats. During peak season, you can anchor in the roadstead between the pontoon where the Restaurant Gennarino is and the rock called Ravia. The whole island is fringed by inlets and coves for sheltering depending on the direction of the winds. From Cala Inferno you can climb up a stairway cut in tufa stone and reach the little town of Le Forna, overlooking Cala di Feola on the west coast of the island, where you will discover many typical restaurants. In Cala di Feola, you'll find a little marina or you can anchor in the roadstead of the little harbor: here you will find the natural pools, excavated by the sea in the tufa stone. The coastline of Cala di Lucia Rosa is particlularly beautiful and is characterized by a series of grottoes and rocks. From this Chiaia di Luna beach you can reach the town of Ponza walking through a tunnel excavated by the ancient Romans. DAY 4: The old harbor of VENTOTENE, Porto Nicola, has been excavated by the ancient Romans, as well as the bollards and the portico running along the quay, still perfectly functioning. At the entrance of the harbour, and more precisely, at the base of the tufa rock which is located where the lighthouse is, you can recognize the ancient Roman fishpond for fish raising, provided with an ingenious system for water recycling through pipes flowing into two covered pools. The island saves other historical vestiges among which the remains of a great roman construction towards Punta Eolo: the Borbonic stairway and the fortress. Besides the old harbour and adjacent to it, towards north, lies the new port, Porto Nuovo (Cala Rossano) protected by a quayed jetty. 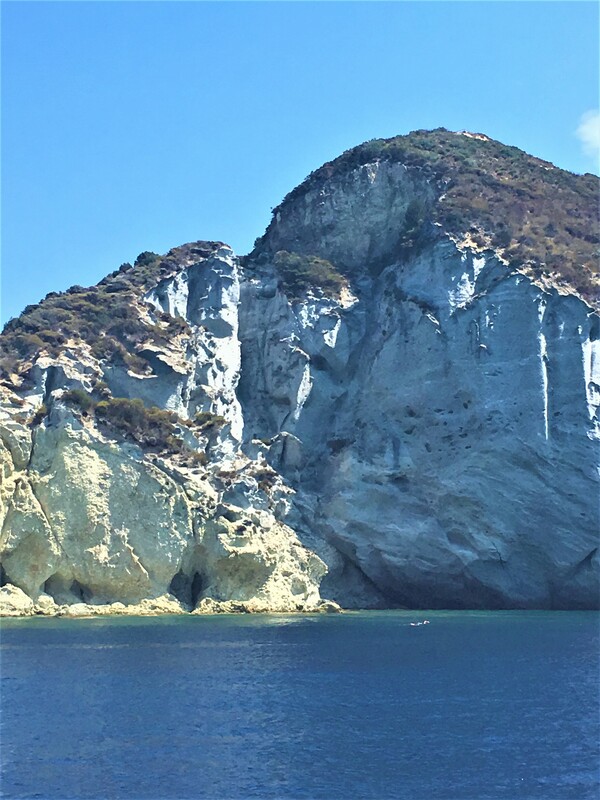 DAY 5: ISCHIA is the biggest of the Phlegrean Islands and is surmounted by Mount Epomeo. Ischia is famous for its thermal springs, for its mild climate and is an international tourist destination. It is characterized by a rich, luxurious vegetation, covering not only the cultivated areas (vineyards) but also the little rocks and the stones, forming the typical "green tufa". The main port serves as the entrance to the city that extends itself all the way to the Aragonese Castle, dating back to the Vth century B.C. DAY 6: CAPRI is formed by two districts: Capri and Anacapri. Its coast is high and irregular. Mount Solaro is the highest peak (586 meters above sea level) from where you can enjoy a spectacular view of the Gulf of Naples. Its mild and very humid climate explains its luxurious vegetation. The island's wildlife is poor but there is an endemic specie, the blue lizard, that exists only in Capri. The ancient Romans built 12 villas here and that can be visited. The cove thats worth a visit is the famous Blue Grotto. On May 14, there is the important celebration of San Costanzo with a procession in the streets of Capri.